As the cold weather winds its way towards us, this thick and squishy throw in Cascade Mondo is just the right partner to cozy up to! 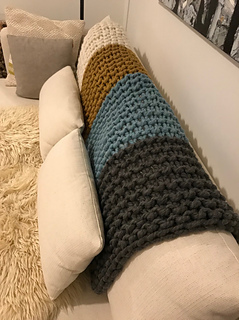 Knit on 25.0 mm (US 50) needles, it is worked up in a flash and makes a great statement piece draped over a sofa or on your favorite arm chair! 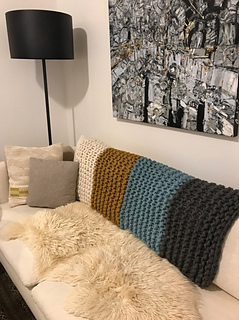 The superfine alpaca and wool blend of Mondo gives it an airy yet substantial fabric that makes you want nothing more than to cuddle up on the couch with it, along with your favorite beverage and knitting project! Choose 4 different colours, knit it all in one colour, or choose three skeins of one colour and then work a contrasting stripe. Any combination would be fab!